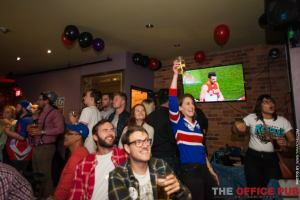 Over 250 people crammed into The Office Pub on John Street to watch the Western Bulldogs win their first AFL Premiership since 1954 at our 21st Annual AFL Grand Final Party. After 20 years of watching Grand Finals at the now defunct Sports Centre Cafe, the Dingos had to find a new location for this year's party. In its first year hosting the Dingos' Grand Final Party, The Office Pub filled up two floors and established itself as Toronto's premier location to watch Grand Finals with its cheap food and drink deals and great sports atmosphere. 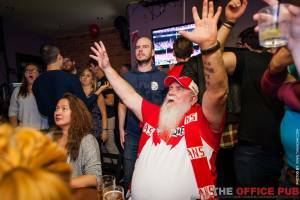 AFL fans from around the world came to enjoy what will go down as one of the all-time memorable Grand Finals, with the Bulldogs emerging victorious by 22 points after breaking away from a resilient Swans outfit in the final quarter. After withstanding two last quarter charges that brought Sydney within a point, a Tom Boyd goal from inside the centre square that gave the Bulldogs an insurmountable lead brought the house down. 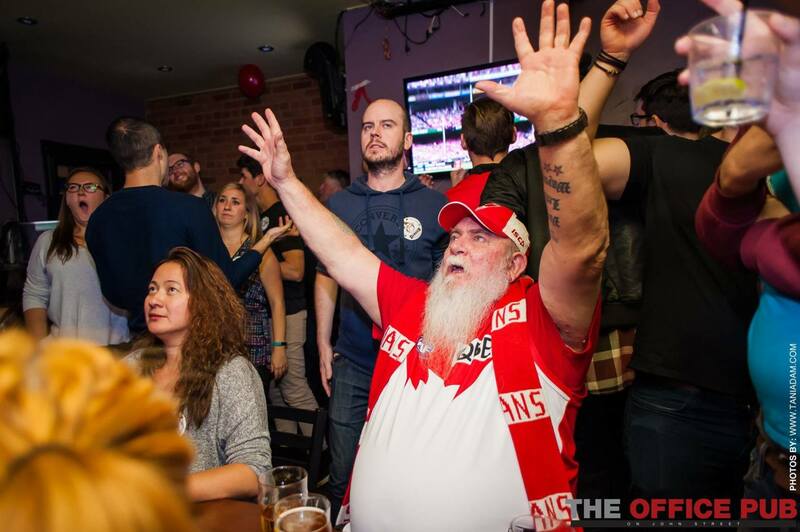 Eager guests began to arrive and fill up the pub more than four hours before the first bounce, with the club organizing plenty of giveaways to keep them entertained. A big thank you goes out to The Office Pub on John Street for hosting the event, everyone who donated prizes to our raffle, and most importantly, to everybody that came and watched a fantastic match. We look forward to hosting another great party next year. Some photos from the night can be found here.